How Do I Get Rid of Gmail Tabs? - Ask Leo! 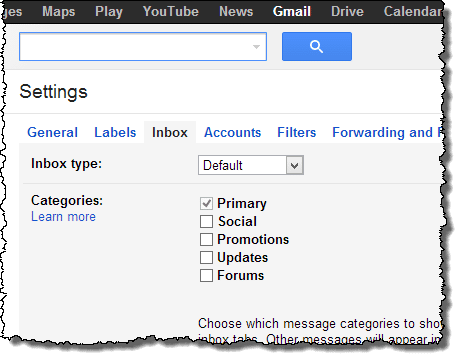 Google recently introduced a tabbed interface to access automatically categorized email messages. If that's not for you, I'll show you how to turn that off. Above my inbox was a series of tabs. You can’t see it here, but when I looked initially, Gmail had “helpfully” categorized my email and put some in the “Social” tab, and some in the “Promotions” tab. Not only did I not need the help (I can manage my email very well on my own, thank you), it felt like Gmail’s categorizations were just … wrong. And of course, because I was away from home for a few days, exactly the same thing happened to my wife’s Gmail account as well. Right or wrong categorization, I knew that she didn’t need or want this new feature either. The “magic” is right there: “Deselect all categories to go back to your old inbox”. That’s exactly what I did and what I did to my wife’s account when I returned home. For various reasons, I’m not convinced that that top-level “Configure inbox” item is going to last. It gives too much prominence to what is basically just one of a hundred different Gmail features. I expect it to go away. 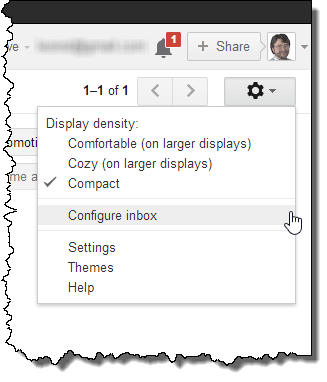 Fortunately, you should be able to control all this via normal Gmail settings. If you’re using the “Default” inbox type, then the process is the same: uncheck all of the categories you can and you’ll get your inbox back. I’m all for change, but I’m also all for choice. I’m very grateful that Gmail has made this an optional feature. The issue is simple: the feature doesn’t work for me. It doesn’t fit the way I handle email. I also don’t want to give up control to Gmail to make its (rather odd at times) categorizations. But when inboxes are overflowing, I can certainly see that this might well be a useful addition. Should I Be Worried about the “Open in Other Locations” Message from Gmail? 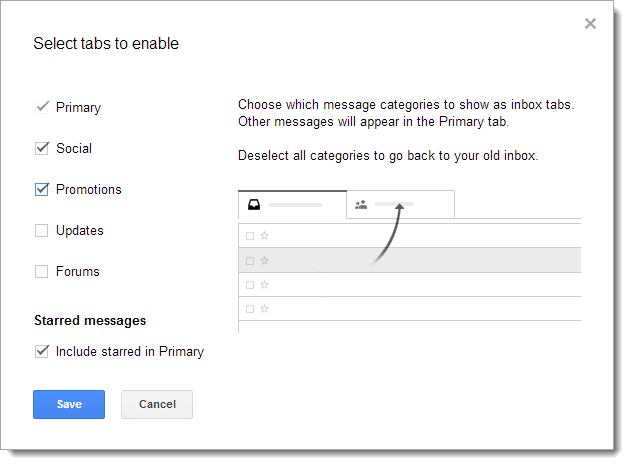 - This is an interesting feature in Gmail. When you’re traveling, it’s kind of fun to see where Gmail thinks you’ve been accessing it from. « Previous post: Why Can’t I Forward an Image in Email? Eerie, while I was reading this article, I got an email notification of an email from Google: “Welcome to the New Gmail Inbox”, Coincidence? Of course, but a coincidence from Google kinda makes you wonder ;). Leo, did you have the tabs long enough to get ads? They show up in the Promotions tab and are not e-mail but are in the e-mail list. They have an “x” on the right-hand edge so you can delete them. I’m thinking that is what’s behind the tabs–another way to put ads in front of us. And thanks for describing how to remove the tabs–my are going, going, gone. I originally thought that the promotions tabs *was* ads. Until I discovered legitimate emails therein. Angered me, to be honest, and contributed to my actions to immediately turn it off. I’m finding it useful at work. A couple of times an hour I have to stop what I’m doing because the Inbox tab is showing Inbox(1). Usually it’s somebody selling something, but I have to look in case it’s some urgent work. Now that the “selling something” mails are going into the Promotions tab, I’m only having to check every couple of hours. But I’ve turned it off at home – I like to see EVERYTHING, as soon as it comes in. The problem is “Promotions” is getting more than just the “selling stuff” emails. For example I believe there’s a high probability that my newsletter is going there. I haven’t touched on it, but it’s VERY frustrating from an email publisher’s perspective for just that reason. are happy how much pain and trouble they are causing. May have to leave after 6 years with them. I wouldn’t mind the tabs so much if they allowed you to name them yourself. Their choices just don’t fit what I’d select. I felt like the proverbial square peg being pushed into the round hole before I figured out how to disable them. Nit picky? Probably. But if their categories annoy me and other categories are a better fit, I should have the option to create them. I had the same initial reaction. I assume the reason is that if you created your own categories, you would also have to create rules about how to assign them. They probably don’t want to support such a complex feature. You can define the folder by who sent it, keywords and where it should go (while normally used for spam control there is no reason it wouldn’t work the other way, I would think). I think you probably already have the tools you needed. It appears that the gmail Android app doesn’t allow you to turn off that feature in the app, even if turned off on gmail server (according to my wife, I don’t use it because I hate threaded conversation mode which you also can’t turn off in that app. I moved to K-9 mail on Android). Thank you so much for this helpful info! I was very annoyed that my gmail just started appearing this way and didn’t know what to do. It might work for some, but for me it was just a time waster requiring extra clicks. I’d rather have my mail all in the same place initially. It is not surprising how many people refuse to read the help files on their device. Most help files are very good at explaining different features and possible problems. Of course if everyone read the documentation and used the info provided, Ole’ Leo would have nothing to do. You can also click on the + at the right=hand end of the tabs to bring up the window to change this setting. The + disappears if you turn off all the new tabs. It’s a brilliant idea. I’m subscribed to a number of newsletters, mailing lists, etc. My personal family & friends emails go into Primary; funny newsletters, jokes etc, etc facebook, etc into Social; Ebay, TradeMe, Grabone, Living Social etc into Promotions; bills, auctions, etc into Updates; and serious newsletters (Like Leo’s, Office Watch, Neat Net Tricks etc into Forums). Never again is my new phone bill lost among today’s offers for cheap meals, discounted phones, and the like. I would like some control over the number of tabs & the names of the tabs but otherwise I feel it’s a big improvement for those of us who get lots of daily emails and don’t want to battle with Rules. Perversely, I won’t use it at work, (we have Outlook anyway) but work email is only two types: business (for immediate action) and spam/UCE (for immediate deletion). I do use Rules at work for folder redirection and other things but struggle with their peculiarities. Sometimes they work, sometimes they don’t. Is it possible that Google has programmed the tabs to work like their spam filter? In other words, the more you use the tabs and correct what it got wrong, the more you train the filter to filter your email correctly? If so, I could see that becoming very useful, like the poster who is glad that his phone bill no longer gets lost in the ads. Yahoo allows each email message to be opened in a separate tab, but they don’t pre-sort the messages into tabs beforehand. Thank you so much! Those “categorizations” were killing me – totally wrong!